I guess it’s true. Flatulence sells, Umm… Mr. Sketch is using farts to sell markers. Forgive me. Gotta stoop to potty talk. I blame the Sanford office and stationery products division of Newell Rubbermaid. Sophomoric as it may be, their Mr. Sketch brand is using fart jokes to sell their scented markers. Fruit farts. That’s the hot air that Mr. Sketch is blowing on consumers in their ridiculous new campaign. The 30-second spot from BBH New York posits that the markers’ scents are a product of ‘green gas’ or ‘violet vapors.’ I really want to light a match to this one. The ad shows a blueberry cutting the cheese, with the scent going directly into the tip of a Mr. Sketch marker. Talk about honesty in advertising! 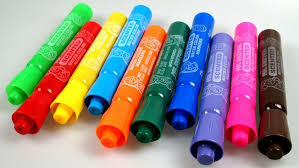 I despise anything scented, and it’s not at all a stretch for me to believe that flatulence played a role in the development of these markers. The spot may get a cheap laugh from kids and jokers young and old, but will likely receive a roll of the eyes from a rather mature crowd who thinks their stuff doesn’t stink. Advertising to kids is great in the right circumstances, but I don’t know any kids who care what brand their markers are. They just want markers, period. However, a marker that smells like a fart in a classroom will make any elementary school dude into the big man on campus (or send him to the principal’s office). Mr. Sketch hasn’t done any advertising for nearly 20 years, and this spot reeks of a brand that never matured past adolescence. Think about what this ad posits at its core. They’re using toilet humor to advertise a product which claims to smell good. Anyone else seeing the disconnect here? BBH New York claims that the farting blueberry ad tested better than any other concept they came up with. I can only imagine the sort of alternatives which would pale in comparison to flatulent fruit. Must have been a heck of a day at the idea factory! The markers themselves draw rave reviews from consumers, but this spot gets a thumbs-down from me. I usually dismiss toilet humor as a cheap, lowest-common-denominator tactic, and I’m not making any exceptions today. Mr. Sketch has been out of the public eye for two decades. Maybe they should have stayed there until they came up with a better way to reintroduce themselves. Something stinks. But it could be the smell of sales. Who cut the cheese while coloring? Ah..that sounds atrocious to me…What kind of a marketing campaign is this??? You have put right words Howard Davidson Arlington MA to describe this campaign…I hope they get it removed ASAP! This is very poor, I am not sure who had advised them to use farts to promote their brand. It hasn’t gone down well with me and I am sure that I am not the only one who thinks about it like this. Thanks Howard Davidson Arlington MA.